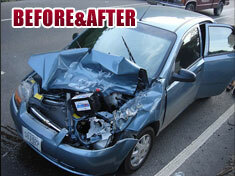 A collision is a stressful experience and being forced to have your vehicle in the shop can be a major inconvenience. At Med City Collision, we do our best to make your experience as stress free as possible. When you need to leave your vehicle with us, we offer a convenient shuttle service to get you back to your work or home and we will pick you up when your vehicle is ready. We even offer pick-up and delivery of your vehicle. After a collision, filing insurance claims can seem complicated. We deal with insurance claims on a daily basis and are familiar with the process as well as many of the local agents and adjusters. To keep your entire experience as smooth as possible, we will help you file your claim. We care about our customers and want to provide the best service available. Besides offering major collision repair, we also repair those little dents and dings that keep your vehicle from looking its best. Whether your car or truck has had hail damage or had suffered a parking lot mishap, we can often restore your vehicle to its original condition without having to go through the time and expense of repainting. Because we specialize in Paintless Dent Repair, or PDR, we can repair your vehicle and get it back to you quickly and economically. No matter what your car or truck needs, our professional technicians at Med City Collision will see to it that you get back on the road in a vehicle that not only looks great but meets the highest safety standards. When you bring your vehicle to Med City Collision, we want to make sure everything is done right from the moment it arrives. From the time your vehicle is checked in until the time it is delivered, every person who works on your car or truck documents and personally signs off on the work they performed to ensure it has been completed to our quality standards. When you bring your vehicle to Med City Collision you will experience service with a friendly, small-town feel combined with the latest state-of-the art processes and equipment. At Med City Collision we won’t just treat you like a customer, we will treat you like a friend. Accidents happen. When they do it may be hard to think clearly so it’s important to know what to do before you get into an accident – things like; what to do first, who to call and what questions may need to be answered. At Med City Collision, we want you to be prepared in the event you are involved in an accident. This checklist will help you know what to do. It’s a good idea to review the checklist now and then print a copy to keep with you in your car. Try to remain calm. Panic can cause others to panic and make the situation worse. Calmly try to determine the extent of damage and to determine if there are any injuries that need immediate medical attention. Call 911 and report that there has been an accident. Indicate whether there are any injuries, how many are injured and the extent of the injuries. Give a clear description of your location to the police. Even in a minor accident it is important to make sure there is a legal accident report. Do not leave the scene until the police file a full report. When people are shaken up, it can be hard not to talk about what just happened, but that can also lead to you not thinking clearly and accurately about what happened. It is important to limit your discussion of the accident and not to admit any fault or liability. You should talk about the accident only with the police and your insurance agent. This is the part most people know they are supposed to do, but often forget about after the accident. It is important to get names, address, phone numbers, driver’s license number and insurance companies as well as insurance policy numbers of everyone involved in the accident. A description of the car and license plate number can also be helpful. Call your agent or insurance company's 800-number immediately. If possible, call from the scene while the police are there. Sometimes the police officer can give your insurance company more accurate information rather than information you may not be recording properly because you are upset by the accident. This can save you a lot of time later waiting for your claim to be processed. Tell your agent where you are having your vehicle towed and where you want to have it repaired. Do not drive your vehicle if it can’t be safely operated. Call a towing company to have your vehicle towed to a repair shop where it can be evaluated by your insurance company’s claims adjuster. Contact Med City Collision to let them know your vehicle is going to be towed their shop. The Customer service personnel at Med City Collision will assist you in setting up the needed documents to begin the process of getting your vehicle back on the road.